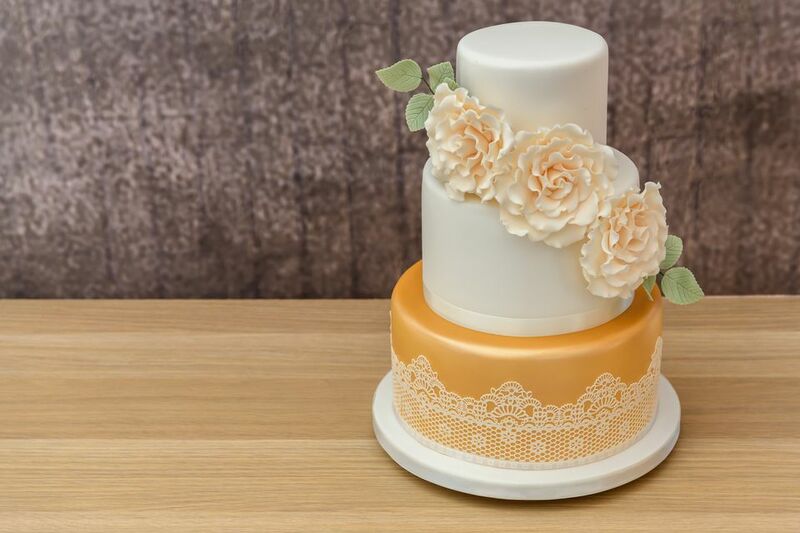 This tutorial will show you how to bake and decorate a round, 3-tier wedding cake, featuring a 10-inch bottom tier, an 8-inch middle tier, and a 6-inch top tier. Each tier consists of two layers, which means you'll need to bake two 6-inch cakes, two 8-inch cakes, and two 10-inch cakes. Try to find pans that are three inches deep. The cakes themselves will be two inches, but the extra room helps prevent overflow. To make this wedding cake you'll need 24 cups of cake batter: 4 cups for the top tier, 7 to 8 cups for the middle tier, and 12 cups for the bottom tier. Remember, each tier consists of two layers. This fluffy homemade vanilla cake recipe is formulated to make exactly 4 cups of batter, so it's just right for making the top tier. To make the middle tier just double the recipe, and for the bottom tier make sure to triple it. Likewise, you'll need between 12 and 18 cups of buttercream frosting. This basic buttercream frosting recipe makes 6 cups, so simply triple it to make the appropriate amount. Finally, if you're planning to split the layers and fill them, you'll need about 5 cups of your chosen filling. Possibilities include jam or preserves, lemon curd, chocolate mousse, vanilla custard, Bavarian cream, whipped cream, or pastry cream. To prepare the pans, spray them with cooking spray, then cut a wax paper round to fit the bottom, insert it into the bottom of the pan, and respray. This might seem like overkill, but it will ensure the cakes don't stick. Remember, these are just guidelines. Depending on the type of oven and how old the oven is, it may run 50 degrees hotter or colder than the true 350 F, which will affect the length of time that the cakes will need to bake. To ensure that your oven is truly at 350 F, use an oven thermometer. Once your oven is set and your cakes are baking, the next step is to test for doneness. When they're done, a toothpick inserted in the center will come out dry, the cakes will appear golden brown, their edges will pull away from the sides of the pans, and they will spring back from your touch. It's especially important that the 10-inch layers spring back. Let them cool for 10 minutes, then loosen with a knife and turn out onto a cooling rack to finish cooling. Baking cakes in advance and freezing them saves time, and helps break the overall task into smaller, more manageable steps. Once cooled, wrap the cakes tightly in plastic and transfer them to the freezer for up to a week. Working with frozen layers is easier. They won't crumble as much, and the crumb coat will go on more easily. Note that it's best to freeze the cakes before you level them. Likewise, if you're planning to split the layers to fill them, wait until after you take them out of the freezer. For one thing, you'll save the trouble of having to wrap extra layers. But more importantly, less exposure to air will keep the cake fresher. Just make sure you have enough room in your freezer. You can also make buttercream in advance. Just store it in an airtight container in the refrigerator, where it'll keep for up to a week. When you assemble the tiers, flip the cakes so the bottoms are facing upward. The straight edge of the cake pan assures that the tops of each tier will be flat. This goes especially for the top tier. If you're planning to split the layers (sometimes called "torting"), you'll again need to place the cake on its cardboard round on a turntable and use a serrated knife to slice it lengthwise. As before, keep the blade level and use a sawing motion while rotating the cake on the turntable. When you reassemble, the cut sides should go together. For extra precision, you can cut a notch in the side of the cake before you split it, and use that notch to help you line up the two halves again afterward. The next step is to frost the cake. Start with a crumb coat. This light, initial coat of frosting acts as a base coat, latching onto crumbs that form when you first apply frosting to a cake, ensuring that the final coat will be neat and crumb-free. Chill the cake for 30 minutes, so that the crumb coat sets, before applying the final coat of frosting. If you're filling your cake, you need to do this before applying the crumb coat. To start, spoon a dollop of frosting onto the bottom of the cake board to act as glue. Place the bottom layer down on top of the cake board and pipe a buttercream dam around the perimeter of the top layer. This will help to keep the filling from leaking out. If you're not filling your cake, simply apply a layer of buttercream to the bottom layer, spread it around, then place the top layer on top. Remember to position it with the bottom of the cake facing up for that flat edge. Now apply the crumb coat, then chill for 15 to 30 minutes. Don't go longer than that. If your cake gets too cold, condensation will form and the second frosting layer won't adhere well. Now each tier is assembled and situated on either cardboard or foam core round, or a cake drum in the case of the bottom tier. Note that the cake drum is wider than the diameter of the bottom tier, so you can get your fingers under it for lifting. One at a time, place an assembled tier on the turntable and transfer a mound of frosting to the top of the cake. Spread the frosting around the top with your palette knife, rotating the cake as you go. Do the same with the sides. Try to work quickly so that everything stays cool. Return each tier to the fridge while you do the next one. A palette knife does an adequate job of smoothing the frosting, but for a really sharp finish, an icing smoother (sometimes called a cake scraper or decorating comb) comes in handy. It's basically a piece of metal with a flat edge and sometimes another, serrated edge. While rotating the cake on your turntable, run the edge of the smoother along the sides in the opposite direction of the cake's rotation. For a rustic finish, hold the tip of your palette knife against the sides of the cake while rotating it to produce a swirl effect. For a so-called "naked" cake, apply the crumb coat, and instead of chilling, apply the outer coat immediately, then use the scraper to scrape most of the frosting off. There are a lot of different ways to use cake supports, but what they all come down to is inserting vertical dowels into the cake to help bear the weight of the tiers above it. You're not fastening the tiers together, just adding support. 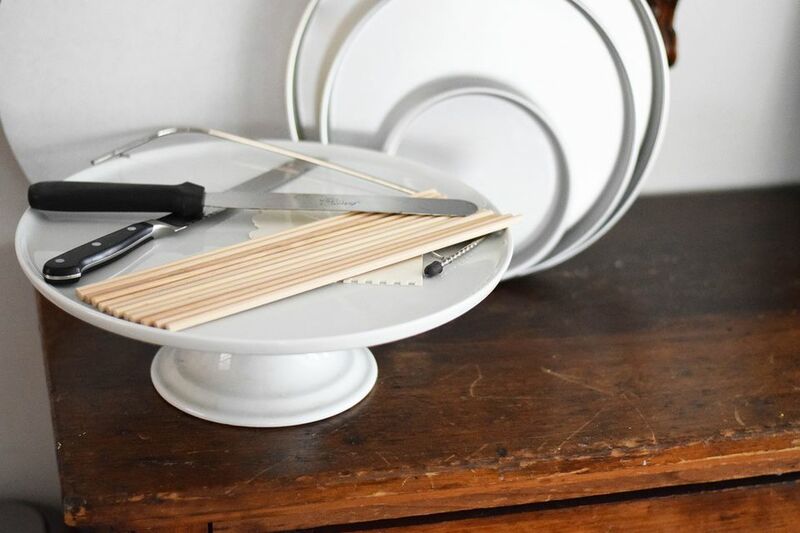 Wooden cake dowels, plastic ones, or even plastic drinking straws can be used. Whichever kind of supports you use, cut them to the height of each tier and drive them all the way through the cake so that their tops are flush with the cake. A triangle formation (three dowels per tier) should be enough support. Your cake is now frosted and stacked! All that's left is final decorations. You can pipe some decorative touches around the edges, or use ribbon, sprinkles, and edible decorations such as fresh berries or edible flowers for an elegant finishing touch.